Overview: We have heard from a couple of sources including GM Authority, that GM wants a standalone reveal event for the C8, in an environment that they totally control. What place does GM better control than the lobby of its GM headquarters building, called the Renaissance Center? Around the time of the C7 reveal, we distinctly remember seeing along the back wall of its lobby, a very, very large space with its about 10 vehicles. However since then, GM has massively invested in its RenCen first floor, huge lobby, now calling it “GM World.” GM World, among many new features, currently has a rotating, Lazy-Susan-like, canted display area holding full-sized GM vehicles. Picture credit/thanks to Derek Moore, NCM Curator. Might the rotating multiple-vehicle-sized ramp hold on reveal day, different GM historical Corvette mid engine sports car prototypes? Video Screens: We all remember that large video screens which were an integral part of both the 1.13.13 C7 reveal, and most recently for the LA reveal of the ZR1 convertible in Nov, 2017. The new video screens in GM World have 5,000 square feet of digital area, the size of two full size tennis courts — perfect for a reveal event, especially if used for an internet simulcast. Size: GM World is huge, can easily and comfortably hold up to 500 people. Another coincidence, for that is roughly the number in attendance at both of the above mentioned Corvette reveals? Last summer, for the first time in years, we started to see several of the Corvette ME prototypes appearing, at key GM events. For example at last June’s Belle Isle Indy Car Race, we saw the Aerovette, the Reynolds Concept and the Corvette Indy Concept. Thank you CorvetteBlogger for the following details. We also learned that Chevrolet brought out several historic Corvette prototypes and concepts from the GM Heritage Center for the Detroit Grand Prix at Belle Isle. Positioned around the great white fountain, were three mid-engine Corvette prototypes, the Aerovette, the Reynolds concept and the Corvette Indy concept. Also on display was the ultra cool 1959 Corvette Stingray Racer. 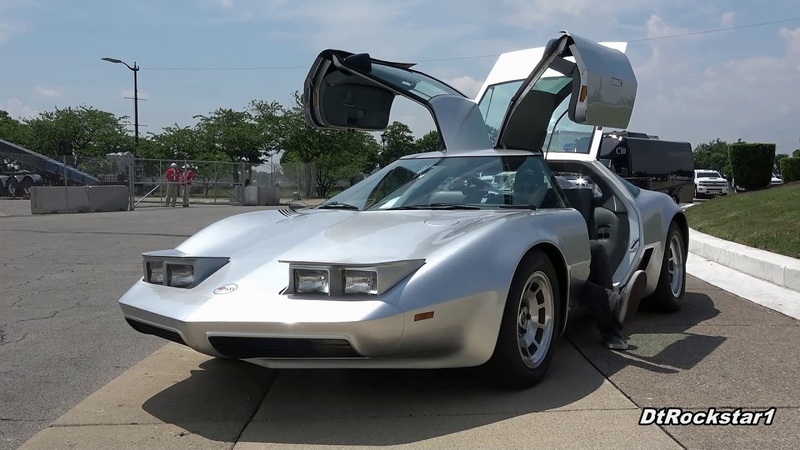 Youtuber DtRockstar1 captured the Aerovette and Reynolds mid-engine prototypes on video and we get to check them out as they are running, along with the demonstration of several features including the interior, engine compartments, and cargo storage. 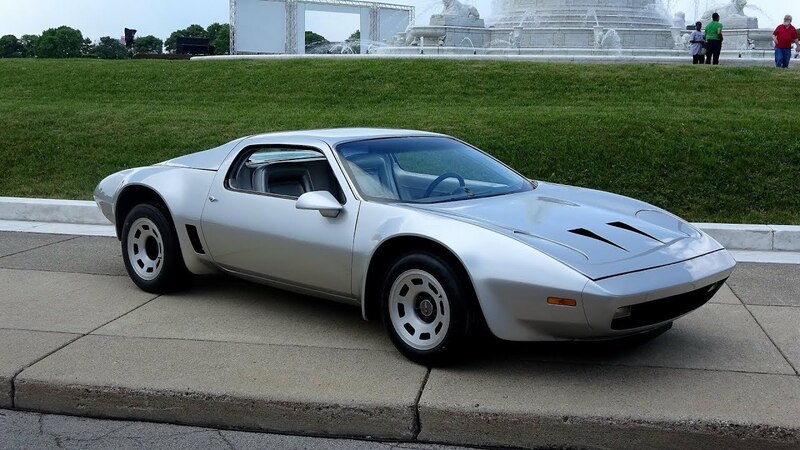 The Aerovette was designed in 1973 by Bill Mitchell and his design team as a showcase for GM’s rotary engines. Under the sloping rear glass was an experimental four-rotor engine. The almond-shaped prototype was fitted with bi-fold gullwing doors and was sterling silver with silver leather interior. After GM ended the rotary engine program, the Aerovette was fitted with a small-block Chevy V8. The Reynolds concept (XP-895) was constructed in 1972 as one of a series of experimental Corvettes designed for testing alternative engine layouts as well as the use of aluminum in car manufacturing. The names comes from the car’s joint development program with Reynolds Aluminum. The Reynolds Concept has a 400 ci Chevy small block V8 mounted transversely behind the driver. Thanks/credit to SuperChevy, we have this picture of the Corvette Indy Concept. We have since seen some of these Corvette prototypes at Corvette Corrals at some C7.R races, including at Laguna Seca last September. I have talked with others in the last few days and they too feel that is it more than a coincidence that after over thirty years in Europe, the XP-897, the Corvette ME prototype which was at one point was going to be the 1976 Corvette, is coming the U.S. in time for next month’s Amelia Island Concours. After Amelia Island, the XP-897 is currently scheduled to next go to the National Corvette Museum. However, on its travels from Amelia island, might it either be “transferred” to GM’s Heritage Center, or might it go to NCM for a short period of time and then, like the earlier two C5 mid engine concepts, head to the Detroit area? Of course, we would only definitively know when GM officially tells us when and where the C8’s reveal will be. Last edited by John; 02-05-2019, 05:02 PM. I think that would be a great location. I've been inside that space and it is very impressive. C8 is a huge car for GM and they will make a big BANG for it. That's why they're taking their time to do it right. C8 isn't the next evolutionary C7, it's a NEW sport car from GM and they will sell a lot of it. Count words! Yes, John, it is very exciting that GM is gathering together all the mid engine Vette prototypes. The most significant being GM's purchase of the CERV I for $1.2M at the 2017 Barrett-Jackson auction. The ground floor of the Renaissance Center is massive. It's like a city in a building, even with its own post office. I didn’t think of the Heritage Center. Sounds good! But, for sheer bang, I still think the NY auto show would have the best coverage worldwide. Maybe Heritage Center first, then NY? Just one of so many possibilities. One of the car shows seems like a more likely possibility with all the press available, and without sending out special invitations. Thanks for the reminder about the Heritage Center also being fairly close by. That is such a wonderful treasure, with roughly 150 historic GM vehicles on display there. Might GM put together an all day event, starting with the Heritage Center, then Milford Proving Grounds but not showing us the ME there, just drive alongs in C7’s, then to the RenCen for the ME reveal around the typical dinner hour? Last edited by John; 02-06-2019, 10:05 AM. That would be pretty cool to have all the prototypes and the reveal alongside them. The scenario you describe above would be one great event John. GM has a master email blast system by which all their accredited media get all their press releases easily. For example, this morning I just got their latest one on their latest financial quarterly info, i.e., they could get the word out within a minute. Assuming GM has structure and control process for determination of reveal date and public disclosure : 1... who decides it? 2. how will it be decided? 3. any metrics or milestones? Is the C8 car completely completed yet? Are all the suppliers in-the-pipe-line-ready to perform? Is GM in position to even think "date" yet? It there a single uncertainty factor(s) about the product in the way? I should simply relax UntiL. Last edited by SheepDog; 02-06-2019, 03:19 PM. I have no idea when or where but I do have to say that reynolds corvette os one of my personal favorites. Last edited by JB; 02-11-2019, 08:01 PM. I think a stand alone event is a pretty good possibility for the C8. There aren't that many US based shows where it could debut IMHO. LA would be the most likely show, but that's November.